I’ve waited to review Egizia until playing with only two. Lisa and I had a chance to play and here are a few comments on one of my favorite games. Egizia is a “worker placement” game for 2-4 players with an estimated time of about 75 minutes. The player with the most victory points wins. The theme sets the game in ancient Egypt but it’s a bit thin. In each of the five rounds, players take turns placing ships along the Nile and taking the action afforded by the position, or taking the action on the card dealt each round to that position. In general, there can be only one ship per position and a nifty mechanic forces players to place subsequent ships downstream of their own previously placed ships. Think Caylus but all workers must be placed starting from the castle and progressing towards the end of the road. With many worker placement games there is a “feed the people” phase. Following that, players quarry bricks from their constructed quarries (cards). Three locations on the Nile allow players to “build” in three areas: Sphinx, graves & obelisk, and temple & pyramid. Building requires the use of quarried bricks and a number of helpers. Your ship placement can allow you to grow your helper count (permanently increasing your “feed the people” costs). Building grants you victory points as well as cards which establish end-game victory points if the depicted goal is met. I found Egizia a very fun game. With all different numbers of players there is a lot of tension when placing your ships along the Nile. Some of the cards are very desirable (quarries, wheat to feed your people, one-time use cards, permanent cards, etc.) but since you can only place one ship per turn you must choose wisely as subsequent players might (and will most likely) take positions that you also wanted. 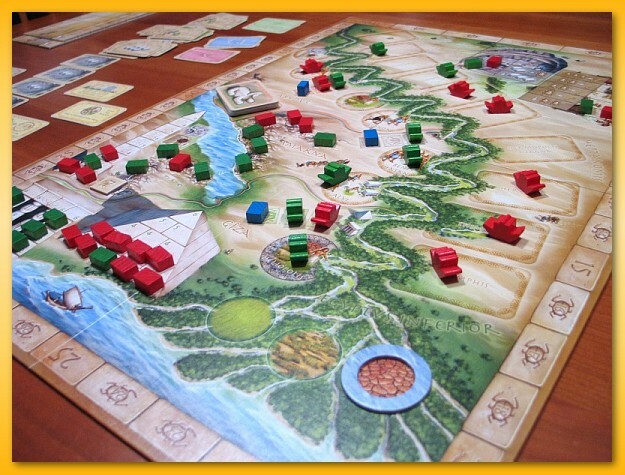 Lisa found Macao a better and “meatier” game for two but even after 8-10 plays, I still find Egizia worth reaching for.